Dungarvin Indiana supports the philosophy of self-determination. The focus of our services is to enhance the individual’s independence and maximize the quality of life. Dungarvin Indiana works cooperatively with each individual, their family, support team and county/state entities to ensure quality services. Specific services and supports that are offered to the individual are determined by his or her personal strengths, preferences, interests, desires, and goals. The range of particular services and supports Dungarvin offers is comprehensive in order to meet the needs and preferences of each person. We provide supported living services through various Medicaid Waivers (Community Integration and Habilitation (CIH), Family Support Waiver (FSW), Traumatic Brain Injury (TBI), Aged and Disabled (A&D). These services include residential services, 1:1 community habilitation services, personal attendant care, homemaker services, and respite services. We also operate 15 community CRF/DD programs (ICF/MR/ESN group homes), four large day program settings, and three small community based day settings. Dungarvin Indiana also provides behavior management services, recreational therapy services, vocational rehabilitation services, and wellness coordination. Dungarvin Indiana uses Sengistix in a number of locations. Sengistix utilizes a wide variety of coordinated sensors to provide a “complete package” of custom monitoring tailored to meet unique individual needs. This automated sensing provides caregivers the ability to improve safety, enhance the quality of life, and increase options for greater independence for all individuals requiring support. The person receiving supports has greater independence because paid staff is only called to the home when needed. For more information Sengistix, please visit our Partners. 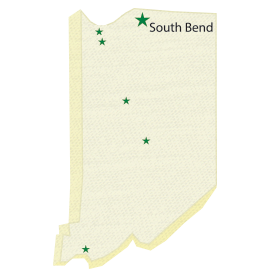 Dungarvin Indiana also provides community-based day program services. These community-based day program services include 1) supervision, monitoring, training, education, demonstration, or support to assist with the acquisition and retention of skills, and/or 2) training and education in self-determination. Each individual receiving these services works toward acquiring the skills to become an active member of the community. The goal of the program is for the individual to become more independent and more integrated within their community and with community activities. Dungarvin Indiana provides supported living services to individuals in their communities throughout Northwest and Central Indiana. These services occur in a variety of settings: in-home sites, individuals supported in the community alone, individuals supported in the community with roommates/housemates. Dungarvin Indiana currently provides a variety of supports and services for many individuals in their communities within various supported living arrangements. We are currently looking for opportunities to bring housemates together in supported living environments. If you would like further information regarding any possible current placement opportunities that may exist, please contact us. “Intensive” training (IT)- Services provided to individuals functioning in the mild to moderate range of mental retardation, as well as, having secondary diagnoses. Focus is on skill attainment in independent living skills as well as a strong emphasis on community integration. Concentration is also placed on eliminating maladaptive behaviors. Dungarvin Indiana currently operates three intensive training homes. “Developmental” training (DT)- Services provided to individuals functioning in the moderate to severe range of mental retardation as well as having significant behavioral and/or medical challenges. Skill attainment in the areas of daily living skills, behavior management and life skills are provided as well as a focus on community integration. Dungarvin Indiana currently operates one developmental training home. “Basic Developmental” training (BD)- Services provided to individuals functioning in the severe to profound range of mental retardation as well as having multiple physical disabilities. Skill attainment in the areas of daily living skills is provided. Enhancement of sensory motor skills is also a strong focus of these services as well a focus on community integration. Dungarvin Indiana currently operates three basic developmental homes.